ePACT supports a multitude of community organizations, including schools – from kindergarten right up to high school, and even post-secondary education like college or universities – and provides faculty with a tool to help them better collect, manage, and securely store critical student information instead of relying on paper forms submitted at the start of the school year. 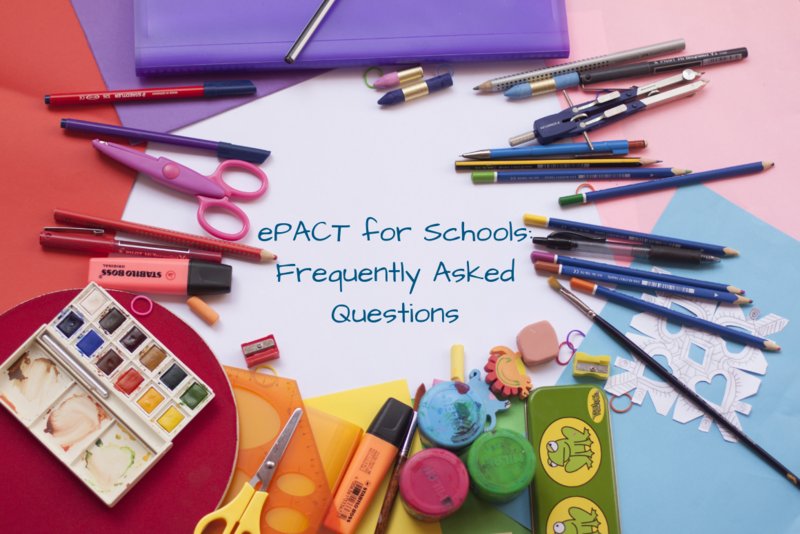 If you’re considering moving away from paper forms, and have questions about ePACT, we’ve got some of the most Frequently Asked Questions right here! How do schools use ePACT for students and families? Schools often require families to submit an emergency form at the beginning of each school year, and a lot can happen between that information/form being submitted and the need to use it – phone numbers change, people move houses, allergies come and go, and dietary requirements may adjust too. Families can use their ePACT record each year that the child is in school – if there’s information to change, families can do so quickly without having to get a new form or having someone manually update a paper copy; if everything remains the same, they simply share their record with the school as it is. How easy is it for families to complete information in ePACT? Families can use the same ePACT record for every organization they’re connected to, and will simply provide additional information as required by those organizations. Families either log in to their existing ePACT account or create an entirely new one, fill out the information they would normally include on a paper form, and submit the completed record to their school(s). When it comes to updating information, families only need to update in one place, and all the organizations and emergency contacts they’re connected to will receive new information in real-time, which saves everyone significant time over paper forms. Through user surveys, we’ve found that 93% of families find ePACT easy to use, and agree that ePACT makes them feel safer and better able to manage an emergency. Who can access information in ePACT? ePACT allows your school to completely control access to student records within the system which is one of many ways we protect the privacy of user information. You can use ePACT to assign different administrator permissions that either allow authorized access to all student ePACT records, or only to specific groups or classes that a staff member is responsible for. ePACT also makes it easy to remove access to student information either at the end of the school year, or if a staff member leaves your school. How is ePACT different from our student information system? Student Information Systems are typically used for student registration, class scheduling, and billing. While they’re capable of collecting additional information like health and emergency contact data, most systems aren’t HIPAA/FOIPPA-compliant; do not provide offsite access to critical information; and often require parents to enter key information multiple times. ePACT helps your school collect, manage, and report on all student emergency and medical information; minimize risk and liability with HIPAA and FOIPPA compliance; ensure safe data storage and authorized user access; and access information securely, and in real-time, with the ePACT mobile app, even without internet or cellular connections.